As 18 Die on Anniversary of Revolution, Egypt Intensifies Crackdown on Activists, Journalists | Democracy Now! director of The Square, which documented the Egyptian revolution of 2011 from its roots in Tahrir Square. The Square won several awards and was nominated for an Academy Award for Best Documentary in 2014.
producer of The Square, which was nominated for an Academy Award for Best Documentary in 2014. At least 18 protesters have been killed as they marked the anniversary of the 2011 uprising in Egypt that toppled dictator Hosni Mubarak, in the bloodiest demonstrations since General Abdel Fattah el-Sisi came to power. A viral video also shows Shaimaa al-Sabbagh, a leading member of the Socialist Popular Alliance Party, being shot dead Saturday at a protest near Tahrir Square. “Like all social change, the fight for democracy in Egypt and across the region is going to continue,” says Karim Amer, producer of “The Square,” which documented the Egyptian revolution of 2011 from its roots in Tahrir Square and was nominated for an Academy Award for Best Documentary in 2014. “What keeps us optimistic is the same critical mass of young people you saw in 'The Square' … are continuing to stand up.” We also speak with film’s director, Jehane Noujaim, about Sanaa El Seif, an assistant producer who worked on “The Square” and is now in prison in Egypt. AMY GOODMAN: We are broadcasting from Park City, Utah, where the 31st Sundance Film Festival is taking place. I’m Amy Goodman. We end today’s show in Egypt, where at least 18 people were killed Sunday as protesters marked the anniversary of the 2011 uprising that toppled dictator Hosni Mubarak. The protests were the bloodiest in the country since General Abdel Fattah el-Sisi came to power. Riot police, backed by soldiers in armored vehicles, sealed off roads, including those leading to Cairo’s Tahrir Square, where the uprising was centered. Riot police with rifles and plainclothes men with pistols were seen chasing protesters through the streets of Cairo. The heaviest death toll was in the Cairo suburb of Matariya, a Muslim Brotherhood stronghold, where eight people, including one policeman, were killed. On Saturday, Shaimaa al-Sabbagh, a leading member of the Socialist Popular Alliance Party, was shot dead at a protest near Tahrir Square. Video and photos of the shooting went viral across Egypt. The leader of the liberal Dostour party, Hala Shukrallah, condemned the killings. HALA SHUKRALLAH: [translated] The atmosphere in which we have been during the past year, after all the struggle, is an atmosphere that cannot be accepted, after what happened yesterday. What happened yesterday should lead to a real response by all those parties that say they are fighting for democracy, social justice and a civil state. We must all take a stand together to ask for no institutions to be above the law. AMY GOODMAN: Also over the weekend, two of Mubarak’s sons were released from prison, nearly four years after they were first arrested along with their father. Last week, an Egyptian court ordered the release of Alaa and Gamal Mubarak, pending their retrial in a corruption case. Meanwhile, hundreds of protesters and a number of journalists remain in Egyptian jails, including the three Al Jazeera journalists, Peter Greste, Mohamed Fahmy and Baher Mohamed. To talk more about events in Egypt, we’re joined now by two guests: director Jehane Noujaim and producer Karim Amer. They are the prize-winning filmmakers of The Square, which documented the Egyptian revolution of 2011 from its roots in Tahrir Square. The Square won several awards, was nominated for an Academy Award for Best Documentary in 2014. Jehane Noujaim also made Control Room, about Al Jazeera. Jehane Noujaim, Karim Amer, welcome to Democracy Now! AMY GOODMAN: Well, very serious developments over the last week that you’ve been here in Park City. First, can you talk about this killing of this activist leader? JEHANE NOUJAIM: Yeah, she was going to put a wreath on the grave of people that had died in the 2011 uprising. She was shot at a two-meter distance by police, eyewitnesses say. And Ragia Omran, a dear friend and a human rights lawyer who was both in the film The Square and is continuing to work on the ground defending many of the protesters that are in prison, attended her autopsy and said she was pummeled in the back by birdshot, which caused internal bleeding, which led to her death. But the impunity of policemen shooting in broad daylight is something that we need to talk about, just like the killings of police here, around the world, is something that can’t go on silence. AMY GOODMAN: The killings of protesters? JEHANE NOUJAIM: Well, the killing of protesters, yeah. I mean, since Shaimaa, there’s been around 18 people, I believe, that have been killed. AMY GOODMAN: You have been documenting change in Egypt, Karim. A major day in Egypt is January 25th. Now, as we move forward, talk about these dates, because it didn’t just happen on one day. KARIM AMER: Yeah, I mean, I think what’s really important for us, as people who are storytellers and active in trying to propel this change forward, is the difference between the event of change and the ongoing struggle for change. I mean, we have these dates. We have these important moments that we like to reference to, like January 25th. But the reality is that there’s an ongoing struggle that continues. And like all social change, the fight for democracy in Egypt and across the region is going to continue. And change does not necessarily happen in a linear manner. You know, there’s a series of ups and downs. And we’ve seen, like in many revolutions in the past, a counterrevolution that is vibrant. But what keeps us optimistic is that the same critical mass of young people, that you saw in our film The Square and that many saw on programs like yours, are continuing to stand up, are continuing to say, “We will not allow for our story to be written for us. We will continue to fight and believe that we have the right to write a more equitable story.” And I think that that is what’s shaping the future of the country, and we will get there eventually. AMY GOODMAN: And, Jehane, the significance of January 28th? JEHANE NOUJAIM: Significance of January 28th was that it was the time that people came back. I mean, I’ve been following protests for a long time in Egypt, made a film in 2007, where you would watch protests happen, people would be beaten up, jailed, but people wouldn’t come back. And what happened on January 28th, people came back and said, “We will not allow this.” And they stayed. And it was really where you saw those images of people really standing up to the police for the first time. It was where that iconic image took place on the bridge where people were showered. So, at this time, years later, it’s a difficult time to be optimistic. I would say that we’re very optimistic people, in general, but being on—you know, continuing to talk to people on the ground in Egypt, going back, it is a very difficult time to be optimistic. But, as Karim said, it’s so important that we continue to be engaged, because in many movements of the past, civil rights movement and others, there have been such ups and downs, and terrible downs, and we just need to remember that if we keep engaged, keep telling these stories, that we will ultimately get to a better place. AMY GOODMAN: —who we met here at Sundance two years ago, when The Square came out, Sanaa El Seif. She worked on The Square. She’s now in prison in Egypt. Sanaa helped publish a newspaper, in defiance of laws requiring government permission, when she was 17. But when you all had The Square here, she was one of those, part of your team, that came out. I had a chance to interview her here at Sundance. She was 19 years old at the time. AMY GOODMAN: The stepdown is when Mubarak was forced out. SANAA EL SEIF: When Mubarak stepped down, yes. 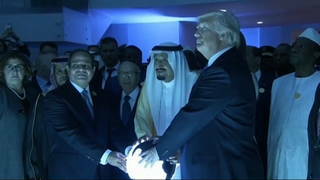 Everybody was talking all over the world, were talking about the Arab Spring, the Arab Spring, but all the cameras left, and we were left alone in the square. And the army was really vicious. And these cameras, this media—we didn’t get that media attention back, until like we lost like a huge number of people. It takes, like—if you have two people or three people dying in the square, the media is not going to be interested in that story. But if you have like a big massacre like Maspero, 28 people being crushed by army tanks, then now the media cares. I think if there had been much more media attention, it could have stopped the bloodshed. It’s possible. AMY GOODMAN: That’s Sanaa El Seif. She was 19 when she came here to Sundance two years ago with you two as you were winning these major awards, the whole team, for The Square. What’s happened now? JEHANE NOUJAIM: Sanaa was jailed in June, and she has been sentenced for—to two years in prison and an additional two years of supervision. This is for participating in a peaceful protest, marching against the protest law, calling for her brother Alaa’s release from prison. 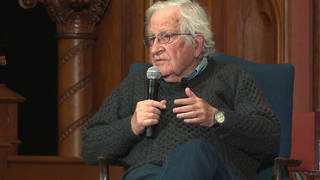 AMY GOODMAN: —who we have been covering, and I hope you go to our website at democracynow.org to see our interviews and Sharif Abdel Kouddous’s interview with him. JEHANE NOUJAIM: So she celebrated her 21st birthday in prison. She’s an incredible filmmaker, an incredible person, a creative mind, you know, somebody that should be the future of Egypt. And so, it is heartbreaking, devastating, that the government is treating their youth this way. AMY GOODMAN: Meanwhile, Karim, the Egyptian activists lost a final appeal at protest sentences—Ahmed Maher, Ahmed Douma and Mohammed Adel—for taking part in unauthorized protests? AMY GOODMAN: And, Jehane—I’m just going to interrupt, because we have 10 seconds—the Al Jazeera journalists, Peter Greste, Mohamed Fahmy and Baher Mohamed, still in jail. You did Control Room. JEHANE NOUJAIM: Still in jail, unjustly in jail, and join many other journalists and protesters that should be out. KARIM AMER: And what’s critical, as both Egyptians and Americans, right now, Egypt being the second largest recipient of U.S. aid, we need to, as active citizens, be aware of where our tax money is going. AMY GOODMAN: We have to leave it there. Karim Amer, Jehane Noujaim, thank you so much, award-winning filmmakers of The Square.